Colorado Peak Politics | BIRTHDAYGATE: Did Denver Council Prez Cross the Line? BIRTHDAYGATE: Did Denver Council Prez Cross the Line? 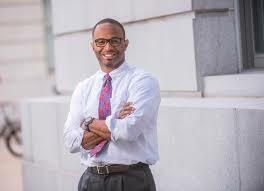 Denver City Council President Albus Brooks is sticking to his guns and has refused to remove posts promoting an upcoming campaign event from his official Facebook and Twitter pages. 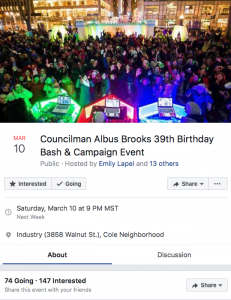 Brooks has removed the promotion for the “Councilman Albus Brooks 39th Birthday Bash & Campaign Event” from his official city council webpage, but he insists his official social media accounts can be used to promote his and other campaigns. On a side note, we can only presume this is his 39th birthday, and not his 39th campaign event, as the title suggests. We’ll find out soon enough whether the postings violate the state’s Fair Campaign Practices Act, because a complaint was filed with the Colorado Secretary of State’s office. According to state law, local government cannot contribute to or promote a campaign. The Facebook page is for elected officials, not political candidates, and the campaign event was posted by a council aide, Brooks told the Denver Post. It was also retweeted on the city’s official Twitter account. Brooks contends the aide clocked out to create and post the event on social media and his webpage. The Facebook time stamp shows it was posted on Friday, Feb. 10 at 10:35 a.m., for an event occurring March 10. The first corresponding Tweet on Feb. 9 didn’t even mention that it was a campaign event, just a birthday party, which by the way cost $10 or $100 to attend. Seriously, the aide couldn’t wait until his day off Saturday or Sunday? This just shows poor judgement at best, or a complete disregard for the separation of political fundraising from the official duties of a city council president, at worst. Brooks admitted to the Post that posting it on his web page “did blur the lines,” but insists that social media pages for elected officials can be used to campaign for themselves and others. It’s interesting that members of Congress disagree. The Colorado delegation has separate Facebook and Twitter pages — one used for their elected duties and a second for their political campaigns.